From Tiviot Dale, across Woodhall Fields, Willow Grove Woods, Blackberry Slopes and Sunnyside Woods, there could be a little piece of countryside nearer to home than you think. 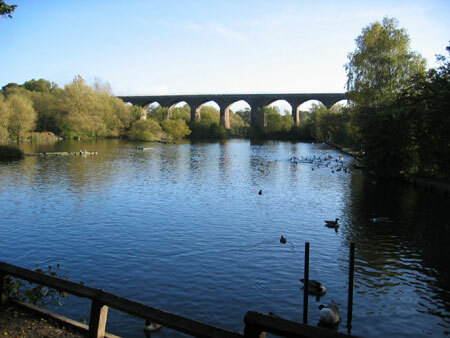 Reddish Vale provides a green corridor linking the town centre with Denton in Tameside at the north and Woodley to the west. There’s walks, cycle and bridleways that link with the Goyt, Etherow, Saddleworth and Longdendale trails as well as long distance routes such as the Midshires Way and Transpennine Trail. Reddish Vale Country Park was opened in 1985. The Visitor Centre is sited on a former industrial complex, including a calico printing works supplied with water from the river via mill ponds and reservoirs. Most of the race has been filled in, but a short length carries Denton Brook down to the river. Denton Brook (and a small tributary) marks the traditional boundary between Reddish and Denton. Sandmartins and kingfishers nest in the river banks. The mill ponds and wetlands which are visited by wildfowl including geese, herons, grebes, cormorants, coots and a variety of ducks. For all the above, contact the visitor centre for details.